Let your Western side show when staying at Courtyard Phoenix Chandler. Our hotel places you within a short distance from popular sights around town including Wild Horse Pass and Rawhide. Unwind upon arrival in our stylish accommodations featuring plush mattresses, spacious workspaces and complimentary high-speed Wi-Fi. Start your morning in Chandler with an energizing breakfast from our restaurant, The Bistro, serving a variety of options and Starbucks coffee to fuel your day in Arizona. Join us again at night for dinner and cocktails. Guests can squeeze in a brief exercise routine using our well-appointed fitness center or opt for a relaxing dip in our sparkling outdoor pool. If you must work, our attentive staff can help you set up a meeting in any of our indoor venues. Surprise your guests with an outdoor reception and evening cocktails on our patio for celebratory occasions. 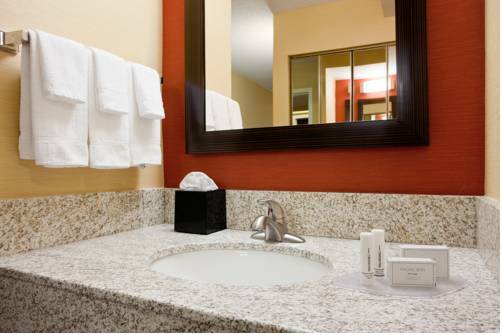 From corporate trips to leisure getaways, Courtyard Phoenix Chandler has what you are seeking for an enjoyable stay.